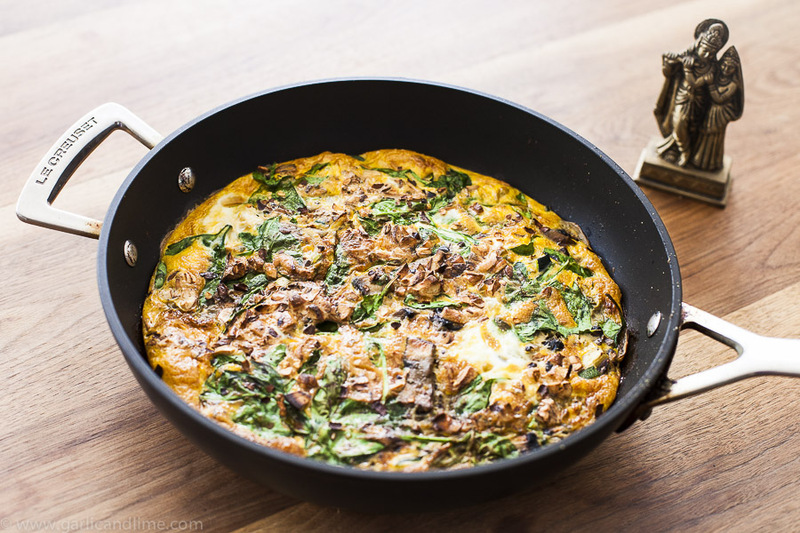 I normally think of an Omelette as something for breakfast, but with the addition of more vegetables it can also be a great light meal or lunch. While this variation uses zucchini and spinach, you can pretty much use any vegetables you like to use up what you have left over in your fridge. Beat the eggs and coconut milk together in a bowl and set aside. Add all of the chopped vegetables (mushrooms, tomatoes and carrot) to the pan, and fry on a medium heat for a couple of minutes until softened. Add salt and pepper, Italian herbs, oregano and paprika and stir well. Add the spinach and toss until slightly wilted. Add the egg mixture and sprinkle the chilli powder over the top. Fry until it starts to set. Transfer the pan to the oven and bake for 5-10 minutes until the egg is set through. You can check by inserting a fork into the Omelette, it should come out clean when it is cooked through. Serve with a simple lettuce salad.